In a popular post I wrote a few years back, SharePoint and Bruce Tuckmans Theory, I discussed how SharePoint could support his model for establishing, developing, measuring and disbanding teams. 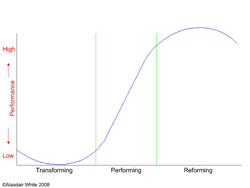 Another interesting model is the White-Fairhurst Performance Hypothesis relating to the performance life-cycle. Developed by Alasdair Antony Kenneth White (is a British management theorist) and John Fairhurst. In 2006, Alasdair worked closely with John and, following various observational studies, they formulated the White-Fairhurst Performance Hypothesis which states that “all performance will initially trend towards a steady state, particularly after a period of performance uplift, and that steady state will then develop a downward curve leading to a significant performance decline”. White argues that what is important now is the trend-change points on the performance curve so that the you can determine the most appropriate performance management actions. Where does SharePoint come into play? SharePoint becomes the place to find people, form teams, collaborate, measure and archive work. Specifically, helping organizations form teams using social networking (e.g. profession and special interest networks), community and project sites. Using analytics to report on performance – accomplishments. Finally, as an archive when the team is disbanded so the teams work can be leveraged others. In a paper entitled “From Comfort Zone to Performance Management”, White examines the hypothesis from a theoretical perspective starting with the Comfort Zone Theory and the work of Robert Yerkes, John Dodson, David McClelland, Tuckman Model and Colin Carnall. They concluded that optimal performance management requires maximizing time in the optimum performance zone. White (2009) refers to the “optimal performance zone”, in which performance can be enhanced by some amount of stress. Yerkes (1907) who reported, “Anxiety improves performance until a certain optimum level of arousal has been reached. Beyond that point, performance deteriorates as higher levels of anxiety are attained. Beyond the optimum performance zone, lies the “danger zone” in which performance declines rapidly under the influence of greater anxiety. This theoretical examination leads White to conclude that the White-Fairhurst Hypothesis broadly holds true and the performance curve is as demonstrated in the White-Fairhurst TPR Life-cycle Model (Transforming, Performing, Reforming). There has been some criticism of White’s approach, suggesting that more recent sources and work would have been more appropriate, but none have been able to offer a counter-argument or to adequately refute or dispute the hypothesis. Have feedback? Would be interested hearing from you.